My second round opponent at Hartlepool was Clive Waters. Although Clive and I have battled many times over the last few years, predicting the opening is seldom possible. I had the Black pieces at Hartlepool and prepared for this game by looking at the Torre Attack, the London System , and even some lines in the c3 Sicilian. It was a complete surprise, when after a few minutes thought Clive played 1 b3, the Nimzo-Larsen opening. Black can play moves like Nf6 then e6 in response (or any number of other setups), but the most direct response is to 'accept the challenge' and setup a big centre with ... e5 and ... d5, which can quickly lead to very rich play. I don't know any theory in the opening, although I was vaguely aware of 2 games: Karpov beating Browne with 1 c4 c5; 2 b3 Nf6; 3 Bb2 g6? ; 4 Bxf6! and Karpov soon had a winning ending, and a humdinger of a game between Larsen and Spassky, where Spassky had aimed for the big centre and won with a brilliant kingside attack (more in a later post). And now White can challenge the centre with the double edged 5 f4 looking to exploit the pin on the e5 pawn (g7 is undefended). When Black can continue with 5 ... Qe7; 6 Nf3 f6 or play 5 ... Qh4+; 6 g3 Qe7; 7 Nf3 Bg4 with a good game. 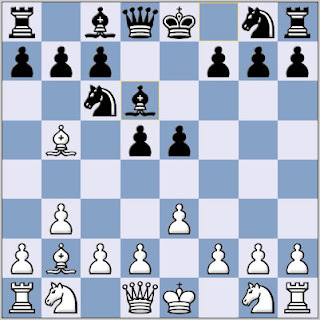 In this position, which has the characteristics of a reverse French, Black has a very interesting possibility: 7 ... Qg5! 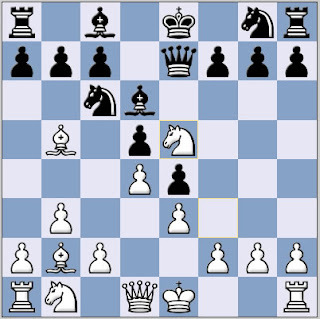 If White now captures on c6 he ends up in a poor position, e.g. 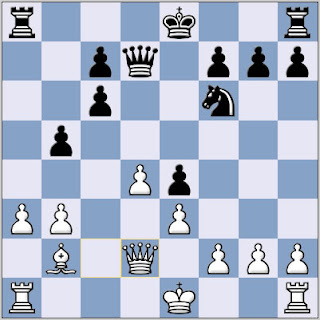 8 Nxc6 Qxg2; 9 Rf1 a6 with advantage to Black. The position still resembles a reverse French in many ways. Black has a collection of weak pawns, e4, c6 and c7 (backward and doubled on a half open file), but they are difficult to attack successfully. As compensation Black's knight is superior to White's bad 'French' bishop, and Black can perhaps generate some counterplay down the a-file or against the White king once it castles (with 0-0, Re8, Re6, Rg6 etc). My verdict: slight advantage to White. He can tie Black down to defending c6, but it's difficult to see how he makes progress. And Black, a pawn up, went on to win the ending. We'll look at the ending in detail in a later post.